What do you get your best friend on her wedding day? 40-Year-old Renate had a plan. 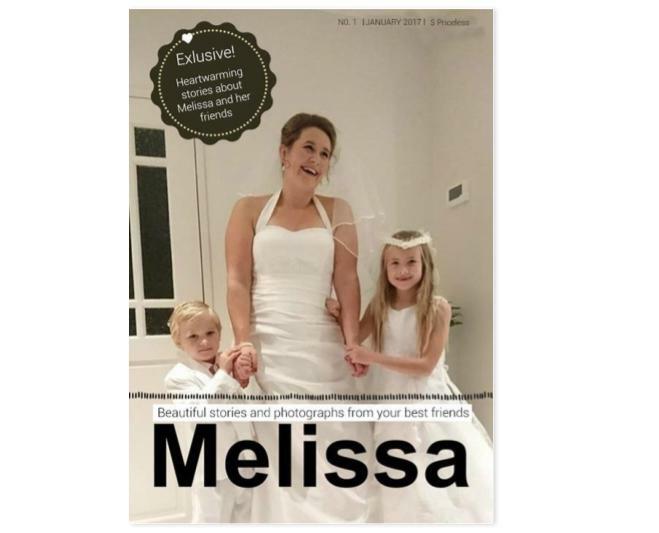 She rustled up all of their friends and together they made a magazine featuring her best friend Melissa, who was getting married to the love of her life. Renate moved in next to Melissa when she was only 3 years old. Now, 37 years later, they’re still good friends. Renate: “We’ve had our fair share of good times together. One of my favorites still has to be when we found out we were both pregnant with our first children at the same time! And last year we both got married, and so we both got to be each other’s bridesmaid. Truly a crowning year for our friendship!”. Renate wanted to find a gift suited for Melissa. A gift worthy of their friendship. Renate: “Not just any gift. I was looking for something special you couldn’t just go and buy from a store. SOmething unique and personal.” Together with Melissa’s other friends she started work on a newspaper. While they were working on the newspaper however, they ran into some problems. One of them was that they had too many text and photographs. Marieke, another one of Melissa’s friends, suggested they make a magazine. This format would enable them to fit all the text and photographs. Her friends added some other pages too, like one filled with facebook comments, another with a crossword puzzle, and a horoscope page with predictions about Melissa and her husband’s marriage.